Let me admit up front. I have not eaten every burger Downtown. In fact, just recently I passed “the Burger Joint” – in Little Tokyo, of all places. Never tried it. Maybe it would surprise me (doubtful but hey – I’m adventurously open minded and militantly optimistic, so you never know). But I’m confident my entry in the Best Burger stakes would at least hold up to anybody else’s. First, some honorable mentions. The happy hour burger at McCormick & Schmick’s in the US Bank Tower has long been a marvel of quality for value. It’s nothing really “special”, but it’s a perfectly good burger – bun, condiments, vegetables, even cheese – and it’s $3 (actually, $2.95). Including fries. It used to be $2. Inflation. But when I was just out of college and working in that building, the ability to eat dinner for $2 – maybe $5, with a happy hour priced beer and tip – was incredible. And they’re still doing it. Gotta pay respect for that. The D-Town Burger Bar (above), on 6th between Broadway and Spring, is great for late night hangover inocculation. It’s right near the Crocker Club, the Association, Cole’s, and the Varnish, and it’s open late. 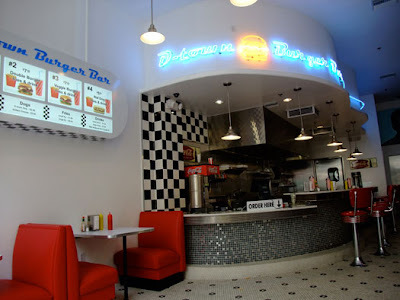 It’s got a fun (if overdone for burger joints) 50s vibe, and the people who work there are usually Downtown denizens who are … tolerant. Which is good when you’re serving drunk people stumbling out of bars. But, when you eat there in the clear light of day, it’s … just OK. Or maybe even good – but not the “oh my god, this is the best burger I’ve ever had” feeling you had the night before. The burgers at Nick and Stef’s are really good, but they don’t win because they’d better be good – dry aged, relatively pricey, and being served at a steakhouse. So yeah – they’re good burgers. But they don’t exceed expectations, and isn’t that part of what makes for a “best of” – something that surprises you? Where is this, you ask? It is in the old ARCO Plaza mall, beneath Flower between 5th & 6th. They are now the City National and Paul Hastings buildings (with Chaya and Drago in between them), but I don’t think anybody calls it the City National mall. Maybe they do – I don’t know. Anyway, anyone who’s been downtown for any length of time knows it as the ARCO Plaza mall. Look for a future blog posting on how they’ve revitalized what used to be this very tired “mall”. But for now, just go there to get the best burger in Downtown. You walk in and order from the cash register. They give you a number, you sit wherever you want, and they bring you your food. 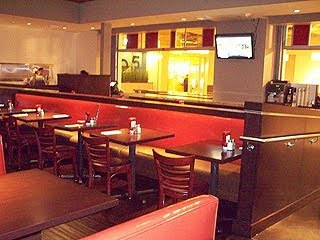 It sounds more ‘fast food’ than it really is – it feels more like casual dining, in a good way. Efficient but comfortable. I had the bacon cheeseburger, and it was simply delicious – fresh vegetables, thick bacon, soft bun. I got it with the fries (natch) and when the woman taking my order was asking whether I wanted them, she said “they’re like In ‘n’ Out fries”. Sold! And she was right. They also have a burger with blue cheese that people swear by, and of course, they have a ton of wines to taste (though I’ll have to report on that after a future visit). And the happy hour looks like it’s got great deals (including PBR for $1!). Aside from all that, they’ve got truffled BLTs with avocado, ahi tuna burgers, sweet potato fries, and other interesting options. The point being that it’s trying way harder than it needs to, serving much better food that it needs to given the captive audience in the buildings above. So … for now at least, I’m dubbing it the Best Burger in Downtown. Stay safe and happy travels. This blog came about because I like to explore what Los Angeles – with an emphasis on Downtown – has to offer. For whatever reason, I tend to try places pretty early, and I always have an opinion about them. So my friends started asking me for recommendations, thoughts, ideas about where to go next. Which led to this, The Amateur Enthusiast. Home | About | Contact | Links | The Amateur Enthusiast © 2019. All Rights Reserved.